In my documentary film “Sixteen Photographs At Ohrdruf” I present the story of a small stack of photos found after my grandfather died. As often happens when making a film, many interesting parts of his story were left out, including large portions of his letters about his time at war. Before I start, here is a short introduction: Donald Grant Johnson was born in Vermont, the youngest son of a Baptist minister. At the outbreak of WWII his oldest brother, Warren, was serving at Pearl Harbor. Don entered the service and OTC, and was assigned to the 65th Infantry Division. 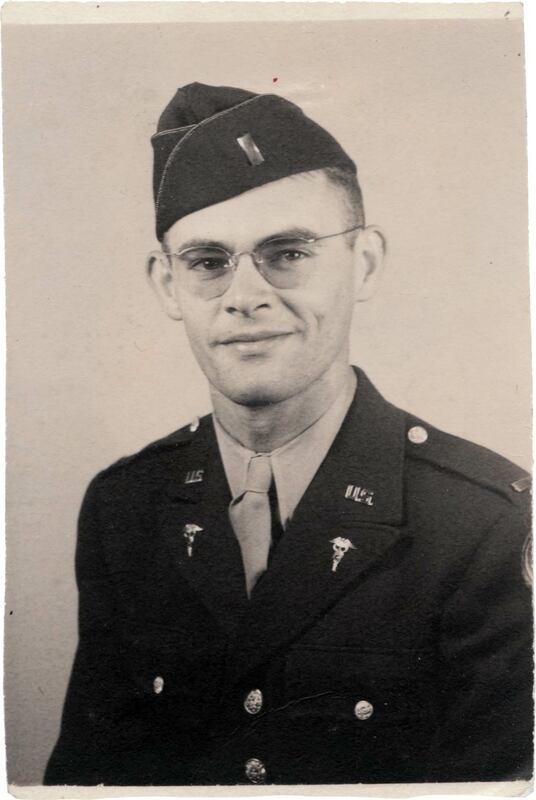 Lieutenant Johnson served as a platoon leader in B Co. of the 365th Medical Battalion. 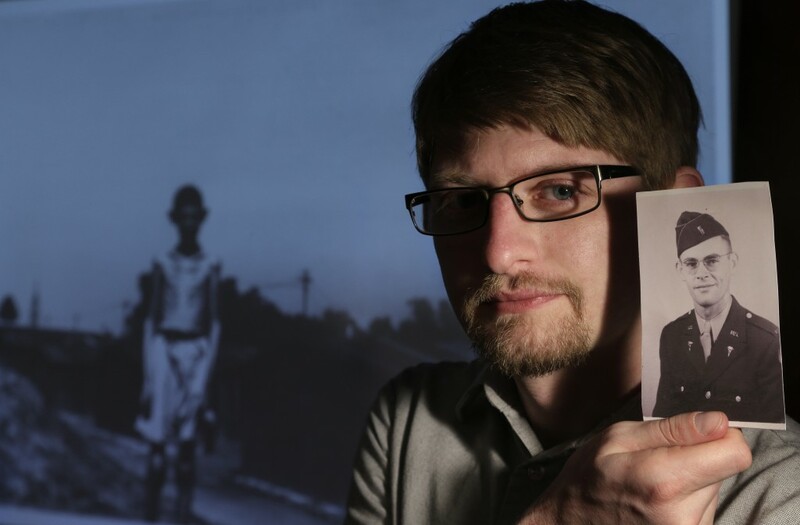 In April and May of 1945, Lt. Johnson was involved in the liberation or clean-up of concentration camps at Ohrdruf, Mauthausen-Gusen and Dachau. 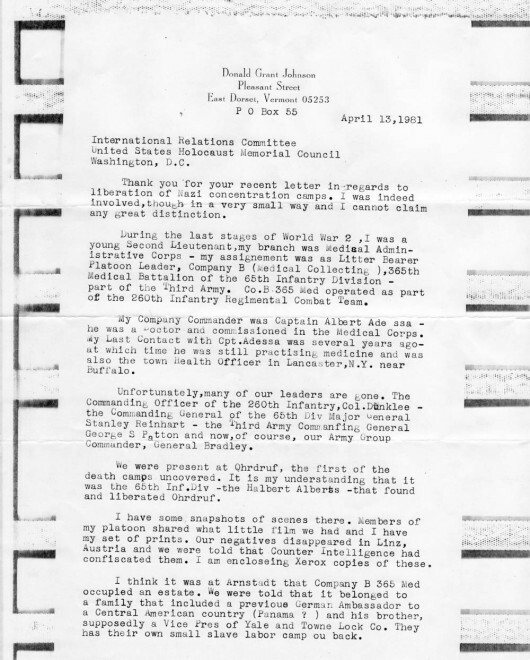 The letters below were found in the same package as the Sixteen Photographs. 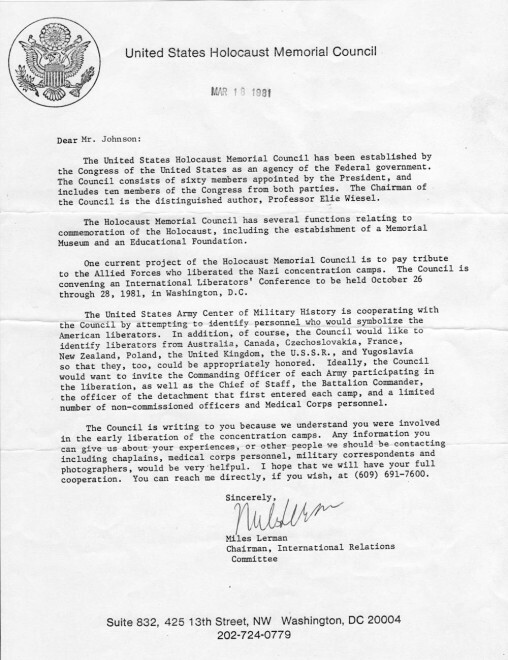 The top letter is from the United States Holocaust Memorial Council, the group that would eventually complete the United States Holocaust Memorial Museum in DC in 1993. The second letter is Don’s response. 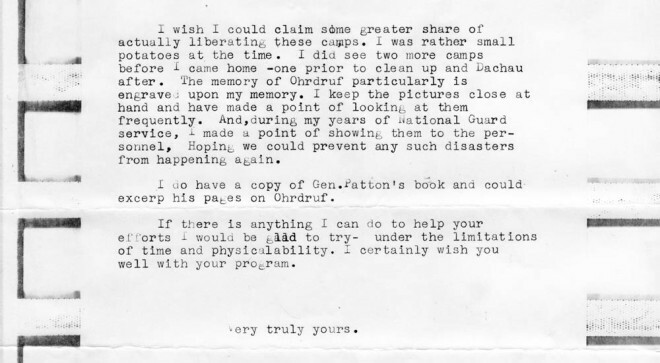 One important thing to note about this letter is the claim that the 65th Division liberated Ohrdruf. Since Eisenhower ordered many troops to tour the camp, and Patton ordered the entire 3rd Army to view the atrocities, many veterans think their divisions liberated the first camp. Also, given that a week passes between the discovery of Ohrdruf and the liberation of major camps at Dora-Mittelbau and Büchenwald, the name Ohrdruf became synonymous with “concentration camp” for many soldiers. Interestingly, the 65th Division is credited as having discovered the huge camp at Mauthausen-Gusen. The discovery is described by the 65th’s Bob Patton at length here, and also in my film. It is possible that Lt. Johnson has confused the camps. He also mentions that “I did see two more camps before I came home – one prior to clean up and Dachau after” — which is probably a reference to Mauthausen-Gusen. No individual memory is ever perfectly accurate, and I’m sure the fog of war obscures the details even further, but I still am fascinated by these letters and the story they tell. If you have any info to add, or know of veterans who can offer an expanded view of this history, let me know. More letters to come next week!